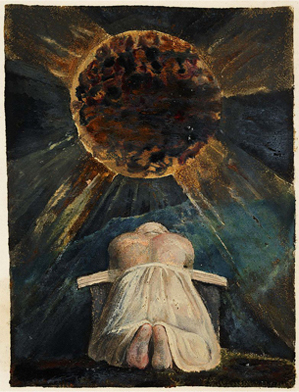 Frontispiece from William Blake’s Song of Los, 1795. As we’ve approached this week’s powerful planetary alignment, pressure has been mounting – in our personal lives, in society at large, and in world affairs. This week, it reaches peak intensity. We’ve been feeling the buildup in stages, starting with new developments in 2010 that reached a crisis point last summer. The tension intensified in late 2013, and by the end of March, it was at near-breaking point. After this week, the four-way alignment in the change-oriented cardinal signs begins to break up, and the pressure will begin to subside. This entry was posted in Forecasts and tagged cardinal grand cross, cardinal T-square, Jupiter in Cancer, Mars retrograde, solar eclipse, Sun in Taurus, Uranus-Pluto square on April 20, 2014 by Pat. The cardinal T-square continues to make itself felt this week as Mercury and Mars oppose Saturn. I don’t expect many of us will face new issues at this point. More than likely, it will be more of the same old stuff. However, we may have to make a few difficult decisions in order to get out of circumstances that have been weighing us down. That includes difficult relationships. I alerted you last week to this Monday’s Mars-Saturn opposition. Although it isn’t as vicious as the Mars-Pluto square we just went through, it’s the day after the Full Moon in Libra, sign of partnership and balance. If you’ve been in an unbalanced relationship, and especially if either of you have been sitting on a lot of anger, this may be the day you finally decide that enough is enough. If you’re concerned that you may change your mind after Mercury returns direct on Saturday, then by all means hold off making a decision until after the weekend. I’d also advise taking a big step back on Tuesday, when Mercury conjoins Mars in Aries. The risk of saying something you can’t take back is too high. You might want to plan on being unavailable for the day. In some cases, yelling and screaming might not be inappropriate. Sometimes it’s the only way to release pent-up anger and restore the peace. Fights – even the unfair ones – don’t necessarily break up relationships and can even move them forward, whereas not expressing anger or expressing it passive-aggressively can damage a relationship beyond repair. Throughout the week, Mercury will be at a near standstill and in close opposition with Saturn in Libra. Normally, this isn’t an overly challenging aspect, as it favors critical thinking. As I always say, you can’t solve a problem if you don’t know what it is. Under this influence, you can pinpoint the problem and source, which will go a long way toward helping you resolve matters. The danger here is that you may think things are much worse than they are, and with Mars in close aspect, the frustration factor is high and tempers are short. We’ll have Venus to help smooth things over until Thursday. After that, she’ll be in Aries, sign of her detriment, until May 15. In Mars-ruled Aries, Venus is less patient, kind and compassionate. It also means that we have a few more weeks of Mars dominating the sky. All of the planets will deposit to Mars except Neptune in his own sign of Pisces and the Moon when in Pisces or her own sign of Cancer. The good news this week – yes, there is some – is the Sun’s entry into placid Taurus on Wednesday. Although we’ll still be under the aggressive Aries influence, we’ll get to catch our breath, and the frenetic pace will slow down a bit. The Sun’s first contact is an easy sextile to Neptune in Pisces. The pathway is open for inter-dimensional communications. Fleeting thoughts and visions may contain important messages. Pay attention to your dreams on Wednesday night. On Friday, Venus conjoins Uranus. This one could go either way. It may bring you a pleasant surprise in love, money, or some other area of life, depending on where they’re transiting your chart. Conversely, there could be disruptive developments in relationships or finances. Whichever it is for you, I suspect that it will be related to events during last summer’s T-square in the early degrees of the cardinal signs. The Moon enters Capricorn earlier on Friday and moves through those degrees as well. I’m tired of all this heavy stuff and am going to remain positive that a happy surprise is on the way. Mercury goes direct on Saturday, making for easy Easter egg hunting on Sunday. Just take it easy on the chocolate. We’ve got enough of a buzz from all this cosmic caffeine. This entry was posted in Forecasts and tagged cardinal T-square, Mars, mars-saturn, Mercury retrograde, Sun in Taurus, venus in aries on April 17, 2011 by Pat. The Bull from the Sea. Monotype by Vashon artist Brian Fisher, 2009. Images of bulls were prevalent during the Age of Taurus, which was roughly 4525-1875 B.C. The Saturn-Uranus opposition isn’t exact until next week, but its effects are strong enough now that they’re overpowering everything else. We start out on Monday with Mercury newly retrograde in Taurus. Traffic and communications will be all snarled up, so do whatever you must to maintain your blood pressure. The Messenger squares Mars in Leo on Sunday (April 25), but the mood could be icky all week, with a higher-than-average risk of arguments. With both planets in fixed signs, neither side will want to back down. Mercury in Taurus will win by saying as little as possible to avoid fueling the temper of Mars in feisty Leo. On Tuesday (Monday on the West Coast of the United States), the Sun enters Taurus. Do I hear a collective sigh of relief? Taurus may have a reputation as stubborn, but the Bull also is placid and steady. We’ll welcome this new energy after the nonstop activity of Sun in Aries. 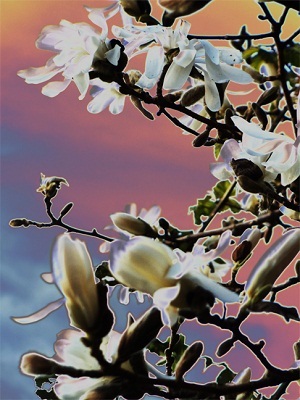 In honor of the Sun in Taurus, I’ve chosen this beautiful image by Brian Fisher, one of Vashon Island’s best-loved artists. Brian’s inspiration was the famous fresco of the bull leapers from the Palace of Knossos on Crete. He has a fascinating history of artwork from this era on his blog. Check out his online gallery, too. After all, art appreciation is a very Taurus thing to do! Also on Tuesday, Chiron enters Pisces, where he’ll stay until August. We’re not likely to notice any immediate effects of this transit, so I’ll deal with it in a future post. Thursday could be especially difficult, when the Moon in Leo conjoins Mars and squares Mercury. Despite what I wrote about saying as little as possible, you may not be able to contain yourself. There will be meltdowns and temper tantrums everywhere. Try to maintain your decorum. On Friday and Saturday, Venus squares Neptune, sextiles Uranus, and trines Saturn within a 12-hour period. If you lose grip on reality, especially in romantic situations, you’ll come back to your senses before doing any real damage. You might even find that reality isn’t so bad, after all. It could end up including a very nice surprise — one that doesn’t disappear when you wake up out of a dream. On Sunday, the planet of love skips into chatty Gemini, and then she’s in mutual reception with Mercury. The danger here is that communications will come fast and furious, but the risk of misunderstandings is high. Be prepared to set records in the number of volleys of phone tag before you finally make your connection. Also on Sunday, the Sun trines Pluto. Normally, trines are pleasant and easy, but Pluto has been in the hot seat lately at the apex of a T-square, and he needs somewhere to vent his pent-up energy. It’s always a dicey prospect to predict earthquakes, but I won’t be surprised if there’s another big one this weekend. The cardinal T-square is still several weeks away, but Saturn and Uranus have been going through an opposition in the mutable signs of Virgo and Pisces since late 2008. When outer planets are in aspect, we don’t need to wait until the exact date to feel the effects, but begin to notice developments a few weeks and sometimes months in advance. This opposition is all the more powerful given that Saturn is “receiving” from Pluto in Capricorn, the sign that Saturn rules. On April 14, a volcano erupted under Eyjafjallajokull glacier in Iceland. The plume sent ash over northern Europe and delayed air travel on six continents. I stumbled on an article in The Guardian by Greg Neale, who noted that a similar event in 1783 disrupted weather patterns in the Northern Hemisphere, leading to crop failures and famine. Many historians believe this was a major factor in the French Revolution, he wrote. Uranus was discovered between the American and French revolutions, which is how he became associated with rebellion. As it so happens, when the Laki volcano erupted in June 1783, Saturn and Uranus were in opposition in Capricorn and Cancer, both square Neptune in Libra — in other words, a cardinal T-square. These are perfect examples of how astrological energies manifest into reality. It’s safe to predict that we’re going to get lots more reality between now and the end of the summer. In the meantime, watch the news headlines now for signs of change bumping up against the status quo. Next week is the Full Moon in Scorpio. I’ll have more later this week, so check back. This entry was posted in Forecasts and tagged cardinal T-square, Saturn-Pluto square, Saturn-Uranus opposition, Sun in Taurus, venus in gemini on April 18, 2010 by Pat. It takes a lot to get a rise out of Taurus (or someone with strong Taurus in his chart). If you’re trying to get a particular action out of them or to convince them that you’re right and they’re wrong, good luck! Taurus not only is stubborn but has unlimited patience. Chances are, you’ll get frustrated and give up way before your Taurus opponent does — unless you’re a Taurus, too. 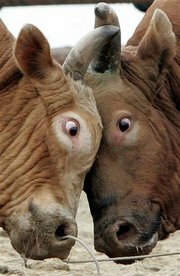 Then you may find yourselves like these two, eyeball-to-eyeball and locking horns. Some other keywords for Taurus are artistic, creative, practical, dependable, short-tempered, argumentative, and materialistic. Of course, keywords don’t apply universally across the board. They are learning tools only and a shorthand method to use in synthesizing the energies in a birth chart. You are far more than your Sun sign, as you know if you’ve had your chart done or if you’re a serious student of astrology. Mercury enters Taurus on Thursday, April 17, at 2:07 p.m. on the West Coast of the United States. The Sun enters the sign of the Bull on Sunday at 9:51 PDT. Photo credit: Lee Jin-man for The Associated Press. This entry was posted in About astrology, Birth chart and tagged Sun in Taurus, Taurus, Taurus keywords, Taurus traits on April 17, 2008 by Pat.